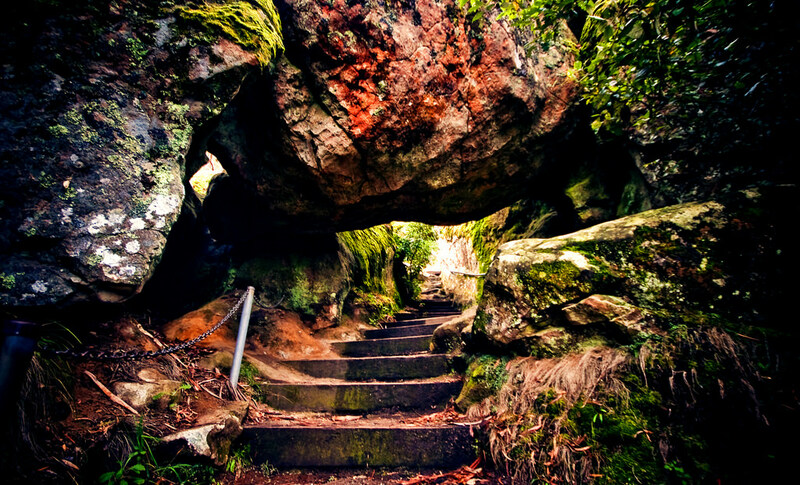 “Picnic at Hanging Rock”, the moody and mystery-laden 1975 film based on a novel by Joan Lindsay and directed by Peter Weir, inspired and set the tone for my pilgrimage to the gorgeous, awe-inspiring location of its setting: the Hanging Rock Recreation Reserve in Woodend, Victoria. The plot of the story, (a work of fiction that is often wrongly assumed to be based on a true story) takes place in Australia at the turn of the century; a troupe of boarding school girls and their teacher go missing after an excursion to Hanging Rock, the beautifully striking 500 foot tall, 6 million year old volcanic rock formation-a very real place- that still amazes visitors today. I am no exception. There is something eerily haunting about the natural beauty of volcanic rock- maybe it’s the idea of the formidable power of the eruption juxtaposed against the frozen-fire stillness of what’s left behind. The film was one of Australia’s first hits internationally, and I’ve been fascinated with setting every since I saw it as a teenager. It is atmospheric and vague, leaving a lot of unanswered questions about what happened to the girls it depicts on that St. Valentine’s Day in 1900, with hints that veer toward the supernatural, the subconscious and dreams, and even toward over-active adolescent imaginations. The air of mystery in the movie is a compelling invitation to experience this remarkable place in person, but it is the tangible, literally set-in-stone beauty of the formation that made it worth the trip. The sweeping natural beauty and connection to the past is unarguably what’s kept visitors like me rapt, even as time marches on around it: the reserve now offers a cafe, a popular horse race track, camp grounds, and even an outdoor concert venue where you could have seen Leonard Cohen and Rod Stewart perform last year. Of course (you know where this is going) there are also picnic grounds throughout the park, where you can indeed enjoy your very own “Picnic at Hanging Rock” and that’s exactly what I did. It was every bit as beautiful as it was in the movie, if not nearly as ominous. Unlike the missing girl in the film, I returned to tell the tale! You’ll have to drive to the reserve, so if you’re travelling the rails, plan to get a ride or hire a car for the excursion. 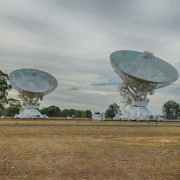 The admission is $10AU per vehicle, and coaches are welcome at $40AU per bus, however arrangements do have to be made with the park in advance to accommodate parking. 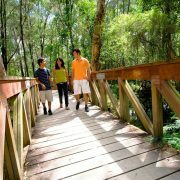 To learn more about the reserve, the history of Hanging Rock, and other attractions in the area, check out VisitVictoria.com.